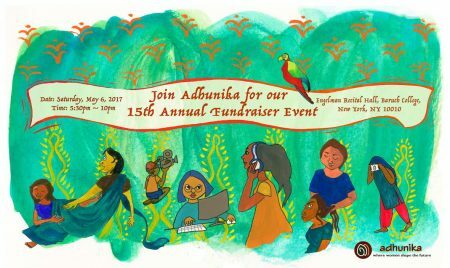 You are cordially invited to attend Adhunika’s Annual Benefit Event to celebrate its 15th year anniversary on May 6, 2017 at Engelman Recital Hall, Baruch College, New York City. MUSICAL POWERHOUSE PERFORMANCES by: Sahana Bajpaie, Punam, Nayema, Rupom, Rousseau, Emon, Nadeem & friends! PRESENTATION BY: ‘A Team’ on Adhunika Foundation, & Adhunika Women’s Centre which is managed by Sajida Foundation & supported by you. PRESENTATION BY: our youngest volunteers will share stories from their recent trips & how they are changing the lives of school-going street children in Dhaka by being their friends & with your support. FOODIE’S WORLD: enjoy authentic mouthwatering Bangladeshi ‘tok-jhal-mishti’ savory food served with love! Adhunika seeks to empower under-served girls and women in Bangladesh through technological training, scholarships and workshops related to health and legal rights awareness, job proficiency and English language workshops. Buy products & photos from solo photo exhibition to showcase the work of Sid S. Y. & products to support projects by Team Adhunika Jr.
We look forward to celebrate the evening with you, your family & friends!